The death toll in Tuesday’s terrorist attack at 14 Riverside Drive in Nairobi has risen to 21 from the initial 14. Kenya’s police chief, Joseph Boinnet, said Wednesday night that six additional bodies were retrieved from the attack site with one police officer succumbing to injuries while undergoing treatment. 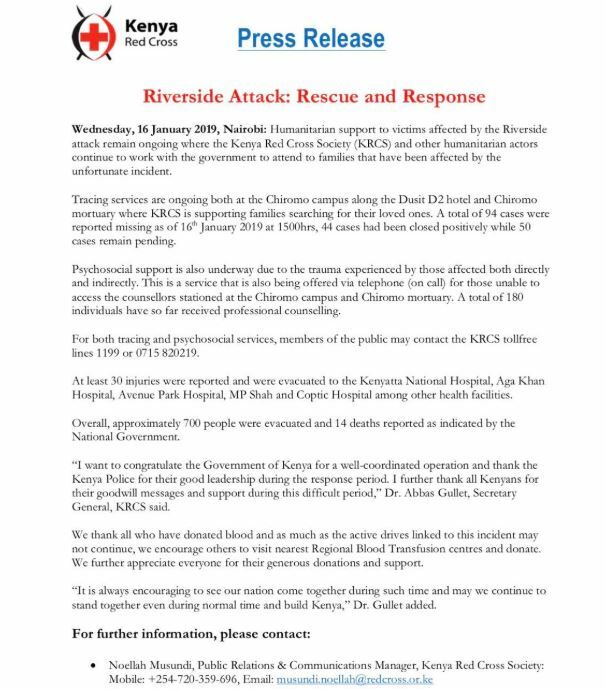 The Inspector General of Police, in a press address at 10 pm on Wednesday, said the 21 fatalities include 16 Kenyans, one Briton, one American national and three persons of African descent who are yet to be identified. He added that 28 persons were wounded during the attack and were admitted to various hospitals in Nairobi. The Kenya Red Cross said at least 50 people believed to have been in the compound remained unaccounted for on Wednesday, raising the possibility of a higher final death toll. Reports indicate that Kenyan security forces killed all five attackers who stormed the upmarket hotel complex. Boinnet also confirmed that two key suspects had been arrested in connection with the attack. “Subsequent investigations by the DCI have yielded arrest of two key suspects believed to have facilitated the attack and are in custody assisting Police with the investigations,” he said. The Somali Al-Shabab terror group, an al-Qaeda affiliate, said it carried out the attack in response to US President Donald Trump’s decision to recognise Jerusalem as the capital of Israel.